As I have mentioned previously Hubs has a new knee. He is doing extremely well, thankfully. Hubs is/was the main dog walker in our family so the worry was Who will walk Benji? All I can say is I HAVE NEVER WALKED SO FAR EVERY DAY! Friends and neighbours have been wonderful and Benji has not lacked a willing walker. Today was a cold, blue sky sort of a day. I took the hound out just after dawn. A friend came after breakfast and took him a few miles up the hill and back. We then decided that Hubs could do with a flat walk to try the new knee so we went to walk along the front in Colwyn Bay. 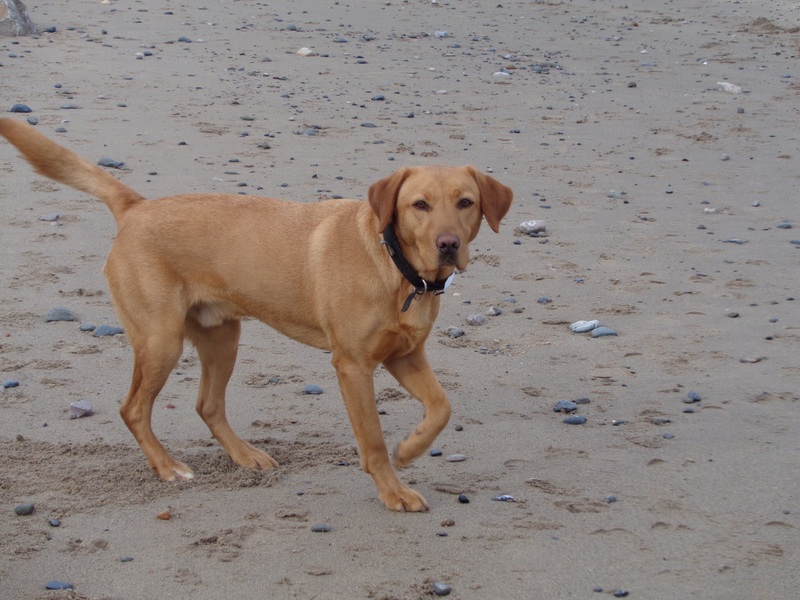 Benji loves the beach but mainly walks between us, he’s a star. This could have been because he was tired from the multiple walks. I MUST be getting fitter. 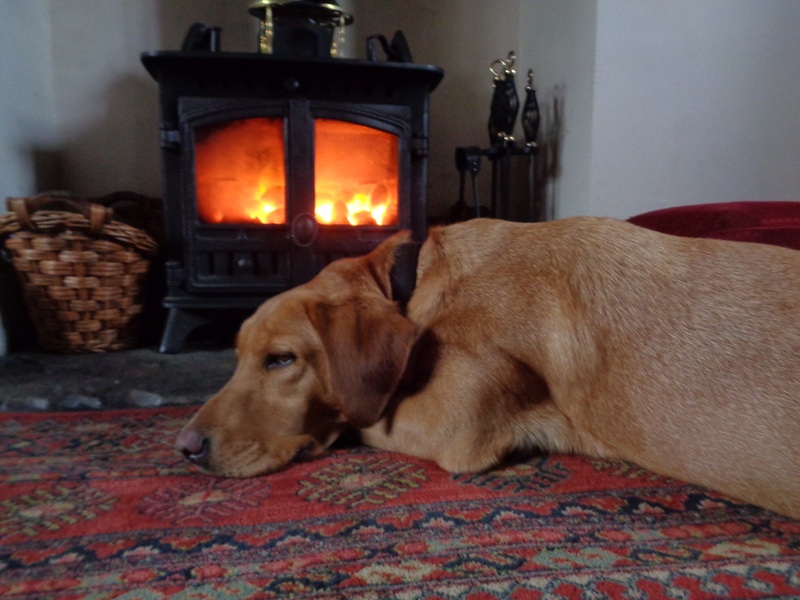 When we got home Hubs lit the fire, dog claimed his rightful place and I took out my knitting. Bliss. The day got off to a pretty good start today! When I opened my emails I had an invite to a “VIP Bloggers Event, Chester Lush” on Sunday next. Wow! This should be really good and I will report back to you eventually. 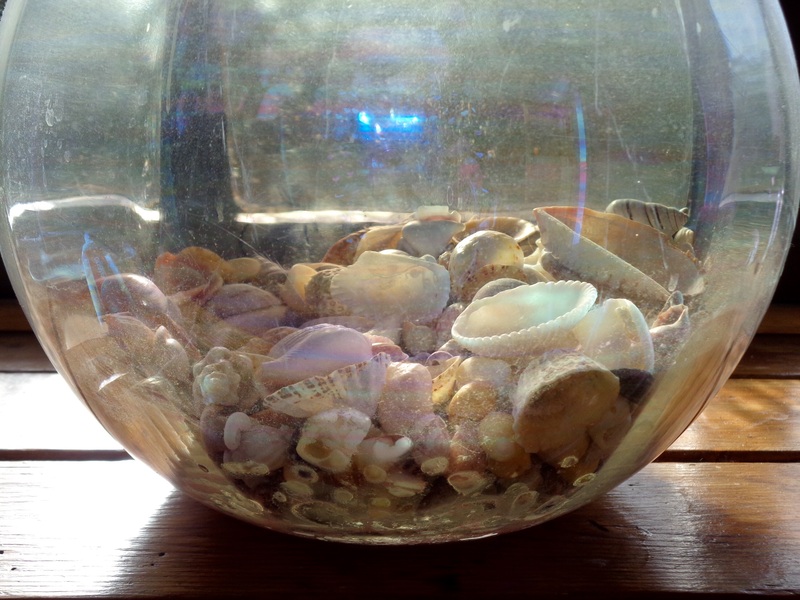 I store these shells in a vintage glass globe on the bathroom window sill. Now what was really strange was when I delved into the shell collection they were all glued together in the bottom of the globe with a dried out gloop! It seems that in the past I put either Lush soap and or bath bombs into the shell collection! 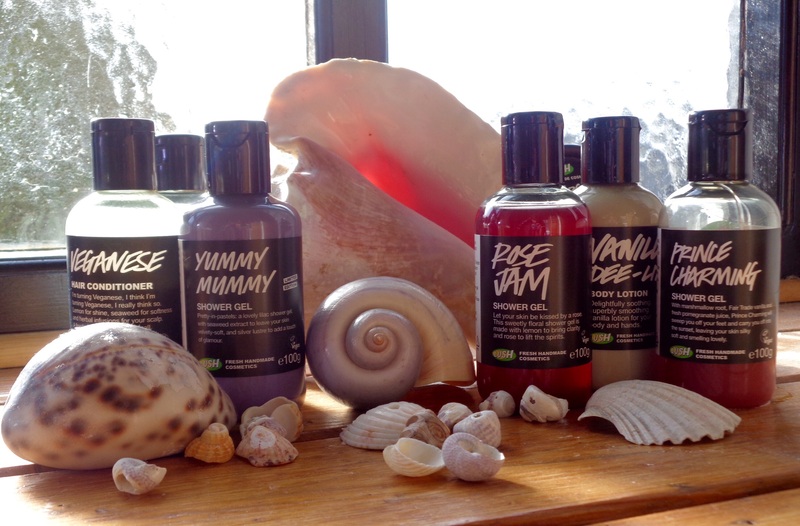 These Lush products must have melted with a combination of sun and condensation and sank to the bottom of the glass. The only way that I could get the shells out was to run hot water into the globe. The smell was GORGEOUS. 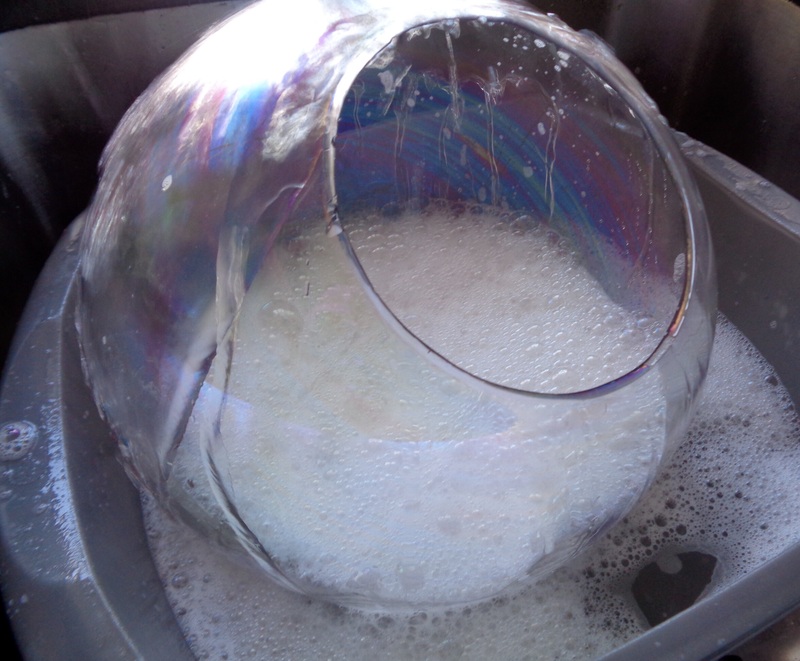 I couldn’t pick the globe up as it was heavy, slippy and smelling lovely. I had to keep running water into the container until all of the Lush product had dissolved and rinsed away! The shells came out and smell delightful. The glass globe, complete with shells, is now back in its rightful place in the bathroom. 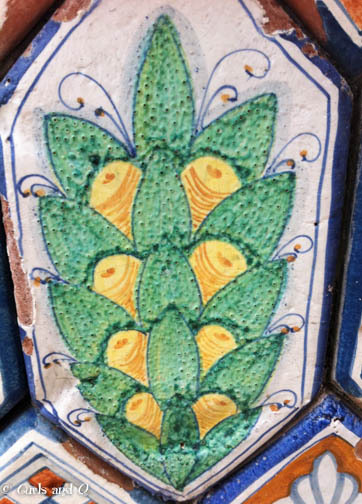 The shells with holes through them have been removed and Lush products returned to the shower. Happy Days! I am putting together a scrap book of many of the things that I have made in the past. Sadly I don’t have photos of a lot of the items as they were frequently made as gifts, worn out or just out of fashion and charity shopped! 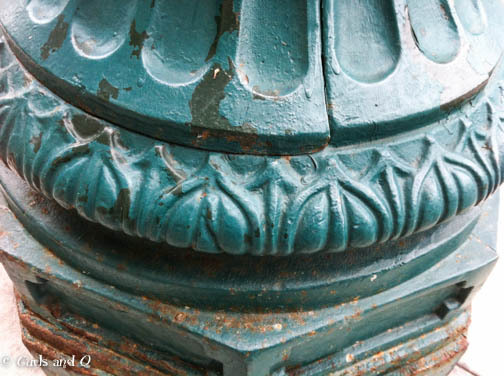 I love taking the pictures or trawling through old pics to seek out the more vintage items that appear in old photos! I LOVE the memories that come flooding back. I also LOVE the scrap book as it gets filled up. I LOVE my Sharpie pens. They are the most versatile, colourful and useful coloured pens e v e r ! Almost every craft project requires stationery! I need “post its” for note taking ideas, page markers, note books, pencils and files, not to mention coloured paper, albums, and of course more pens. Oh don’t forget files, boxes, scissors, paints, and always more pens. I have crafted for ever! I love to knit, stitch, sew, quilt, re-purpose, crochet. I love to read about crafts, plan to craft and write about crafts! 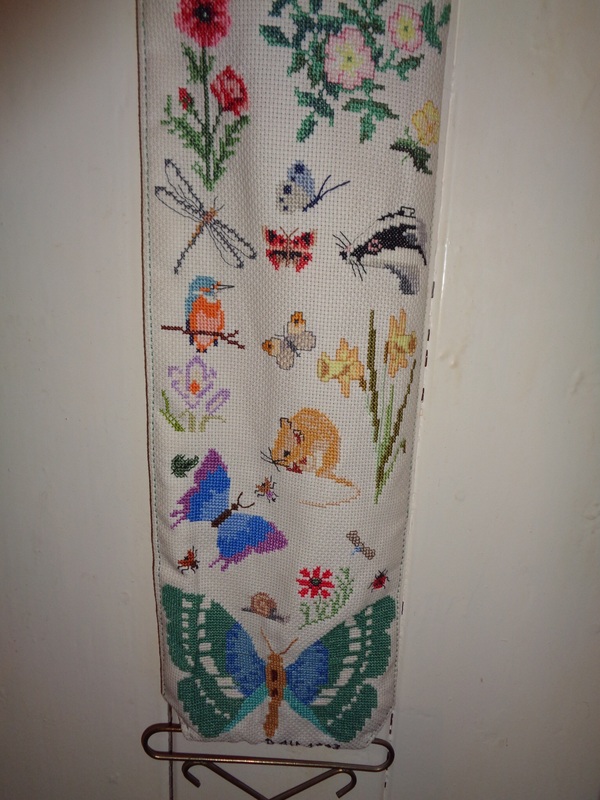 As a child I knit and sewed doll house curtains. 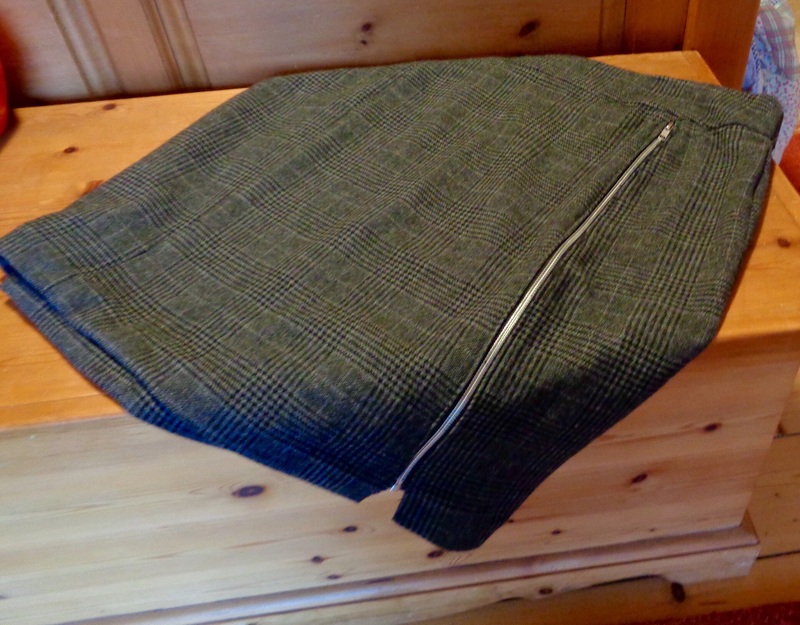 As I teenager I made my own clothes and seat covers for the family camper. As a young woman I dress made and knit for my children. As a mature woman I now attempt a multitude of crafts! I love to blog! 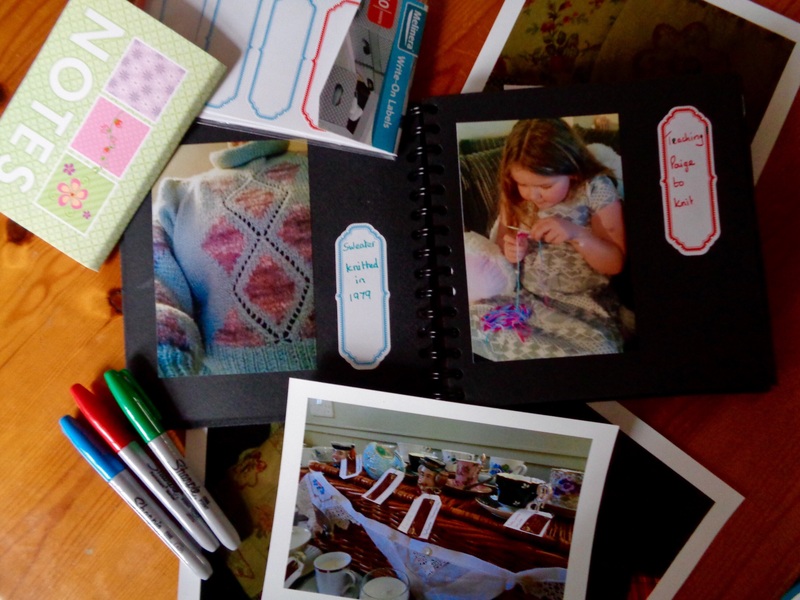 Blogging is a great log of all my crafting projects, both current and past. Blogging is also a log of all my vintage finds and some of my belongings. Blogging is a great way to chat to like minded people. I don’t look for monetary reward for my blogging (although it would be good if I knew how!) I just love to blog. Finally I’ve done it! I’ve threatened to do it for a long time! Now it’s done! I’ve sorted all my knitting needles and I mean really sorted. 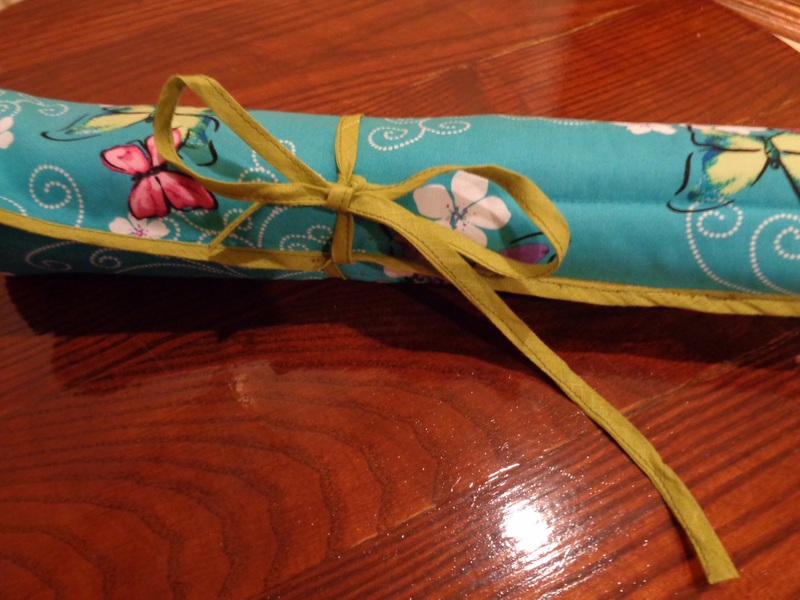 More than a year ago I bought a needle roll from a crafty friend (thank you Lyn) and it’s been in my stash cupboard ever since. 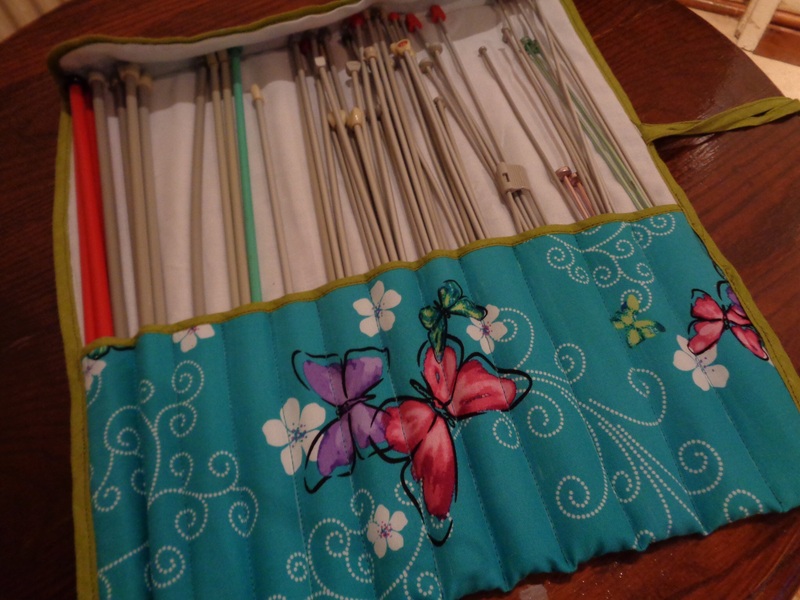 I have LOADS of knitting needles and pins. I inherited my Nannas ( Grandmother’s) and subsequently my Mum’s. I have complete sets of original needles, complete sets of metric needles, not to mention Tunisian crochet hooks, crochet hooks and double ended knitting pins, circular needles etc etc. in fact I could open a needle shop! 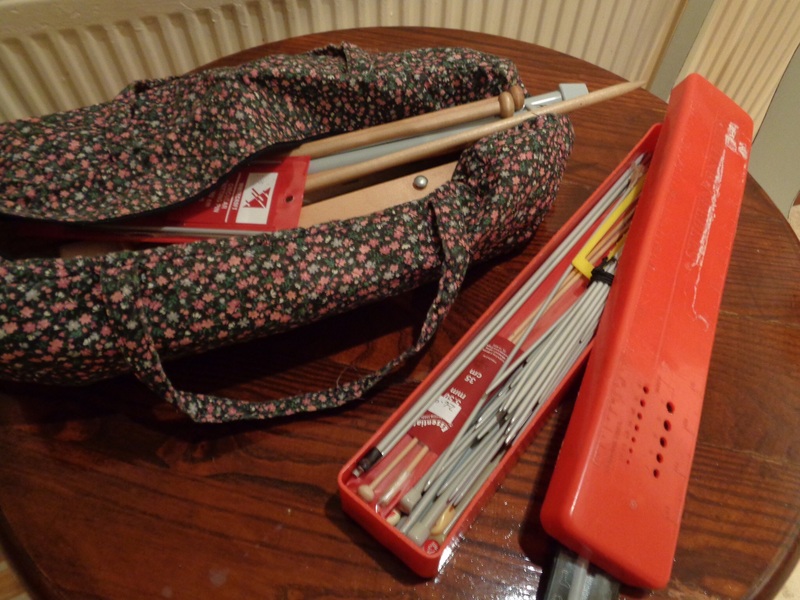 As I have already mentioned I have sorted out a complete set of knitting needles into the lovely, well made needle roll. They are in size order and can easily be found when needed. Phew! I haven’t touched my stash of crochet hooks or double ended pins. I also seem to be amassing a set of circular needles! Is there no end to the “must have” kit that crafters can’t manage without? Hello Dear Friends! Having blogged about counted cross stitch last week I remembered my first ever cross stitch attempt. This sampler was purchased as a kit, where the pattern was printed onto the fabric. Actually aod way to learn cross stitch. The sampler was worked in 1985 as you can see. In those days I worked as a Radiographer in a busy A and E department. ( Accident and Emergency, ER -but no George Clooney). Now when I say busy we had quite a lot of down time as I worked mainly evenings. During these quiet moments I used to stitch away. Cross stitch was perfect as I could drop it at anytime. I am certain that in more recent times crafting at work would not be possible! But this was in another era. Can anyone else work at crafts at work these days? This particular sampler has a very worthy saying which, incidentally I didn’t choose! 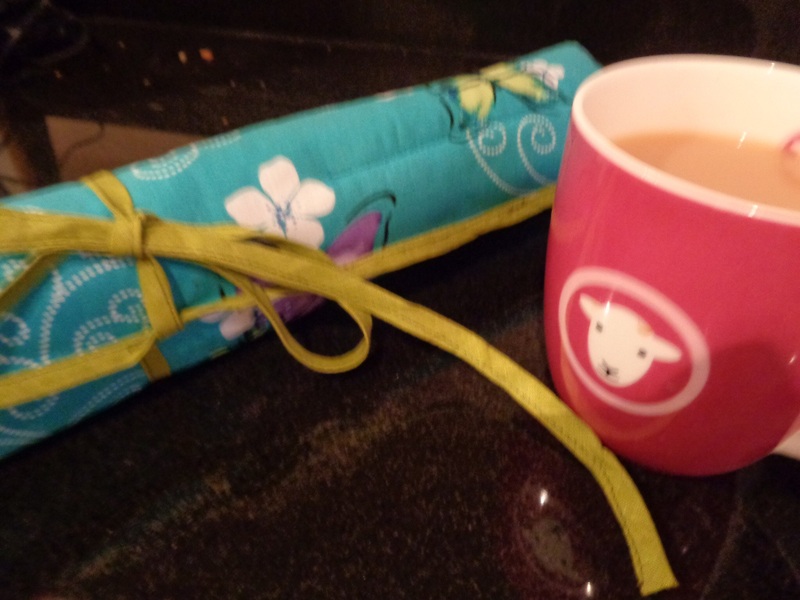 My Return to Sewing Project! Ive finally finished my ” return to sewing” project! Yippee! I suppose that it is really a return to dressmaking project. 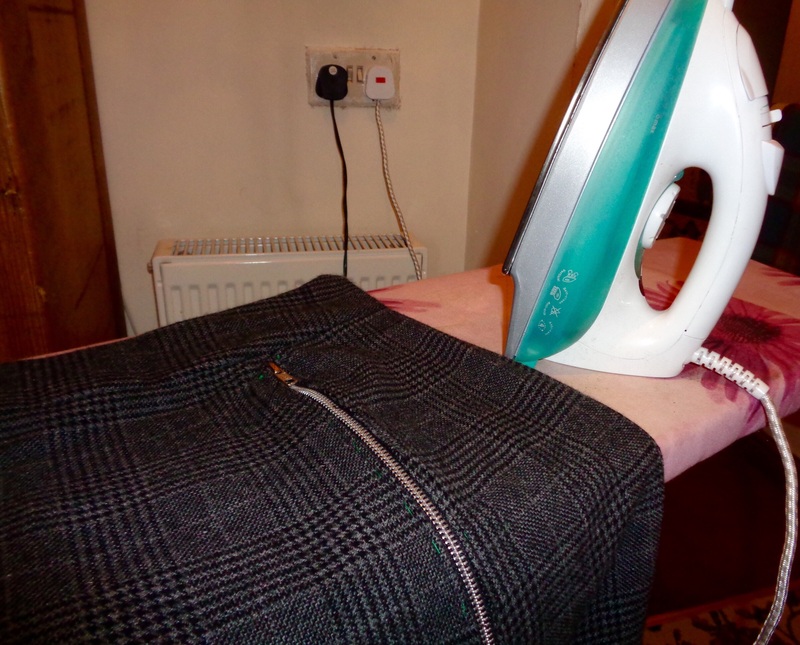 I’ve continued to sew throughout my adult life but it had been many years since I’d made a garment for myself! I don’t know why, except that clothes can be bought quite cheaply and I can usually find a good fit. There is NOTHING to compare to completing something to wear for yourself (and being pleased with the result). This skirt has taken me an age to make. I have prevaricated, hesitated, hummed and hawed and generally been frightened to give it a go. But I’ve finished it and it fits! I didn’t choose very sensibly for a new project. 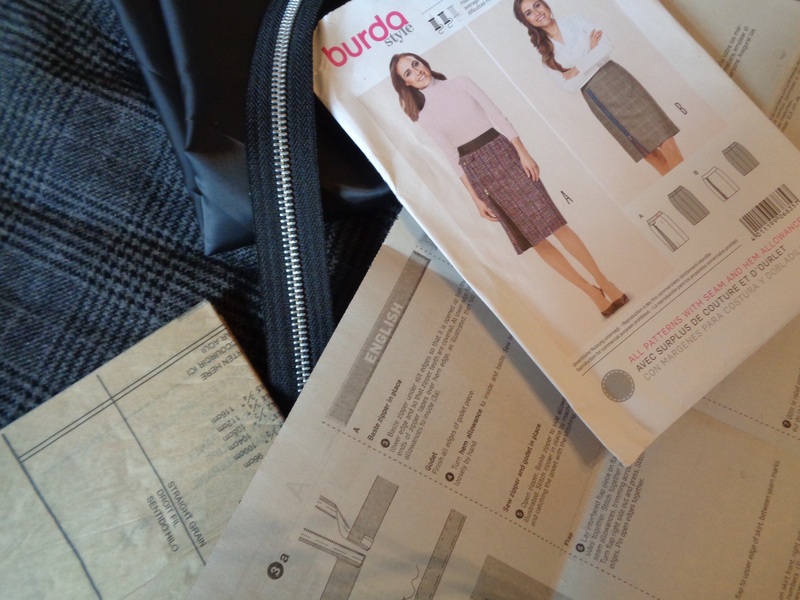 I bought a Burda pattern with unfamiliar American sizing, so more or less guessed the size to make. I naively chose a woollen fabric with a plaid pattern requiring pattern matching, and I shoud have lined it but didn’t bother. I will wear it with a satin and lace underskirt to give it some foundation. Well the World is my oyster now! I am planning to sew more! I hope to make a summer skirt but I will let you know! 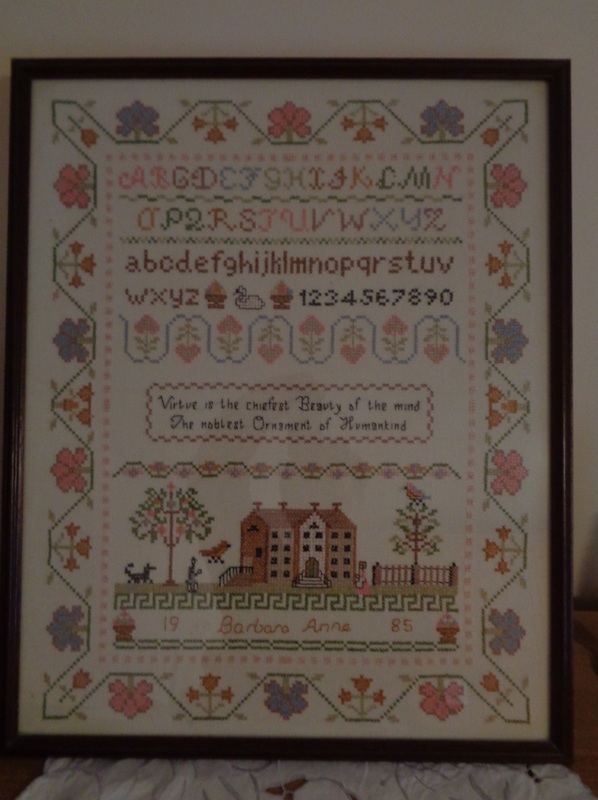 Quite a few a few years ago I went through my “Cross Stitch Era”. I find that all craft work ( for myself at least) comes and goes in phases of learning, enthusiasm and creativity. Cross stitch passion lasted quite some time and is one of the most artistic of crafts. 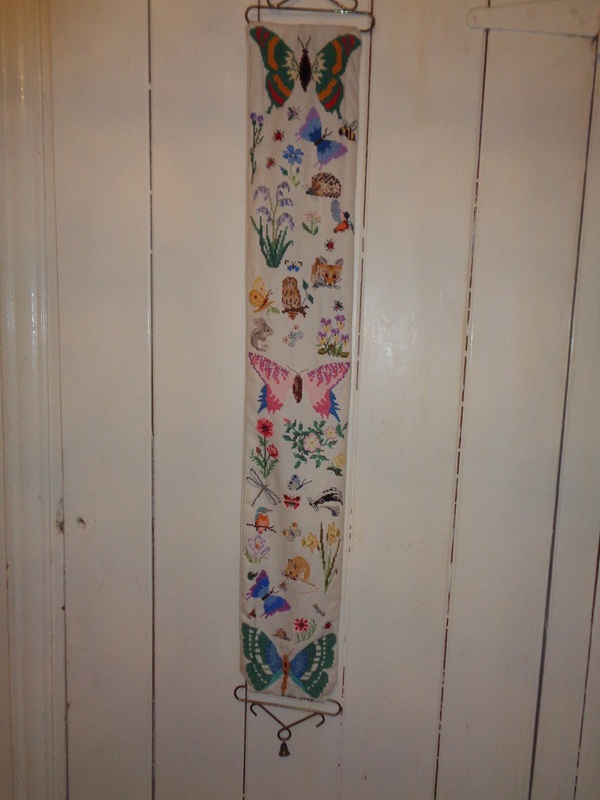 This cross stitch bell pull was made for my parents and hung alongside their fireplace until we cleared the house. I stitched the bell pull onto Aida fabric and used a cream linen backing- which covered up many errors! I purchased a manufactured bell pull metal hanger. 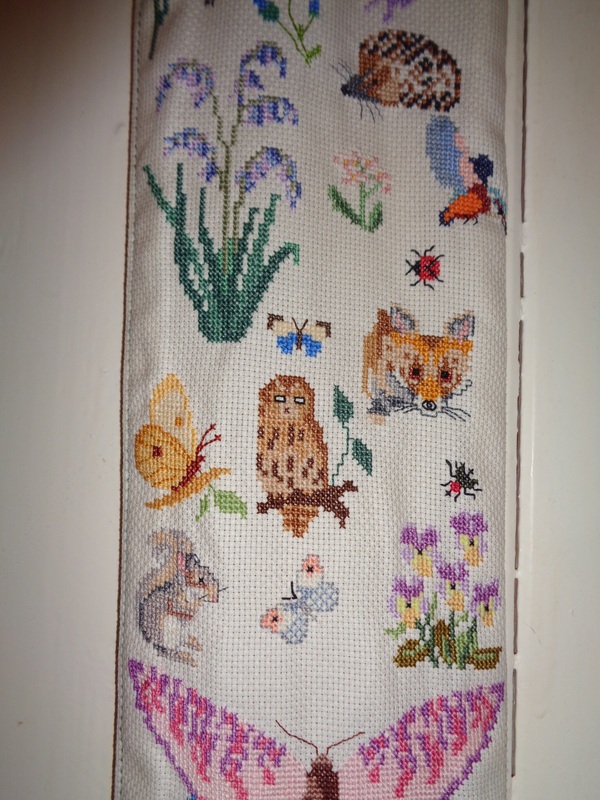 I made this cross stitch sampler in 1993 not using any particular pattern. 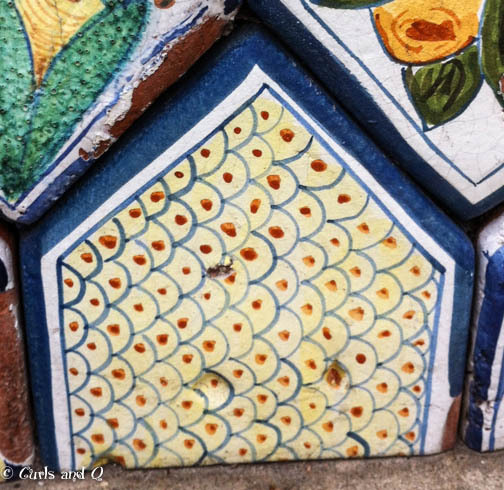 I chose separate nature patterns, from various magazines and books, and interspersed them throughout with little random thought. 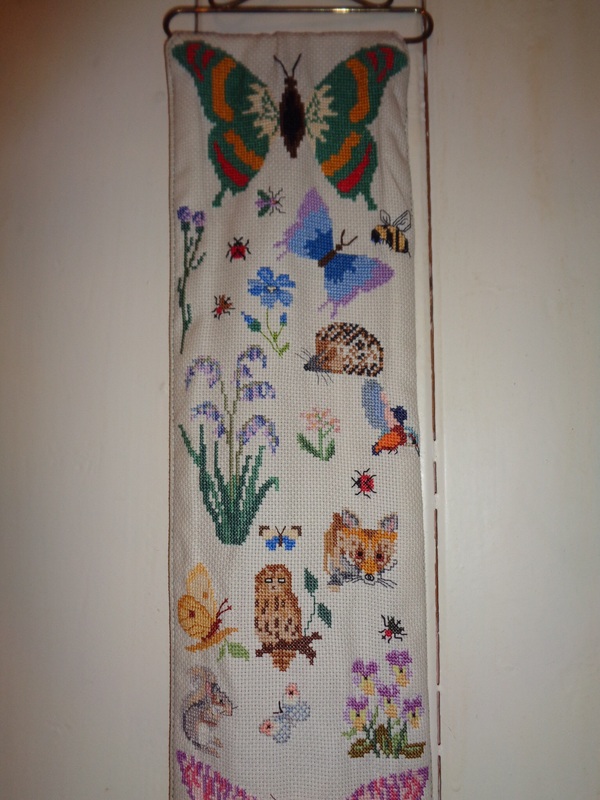 I sewed three larger butterflies which divided the other pictures. 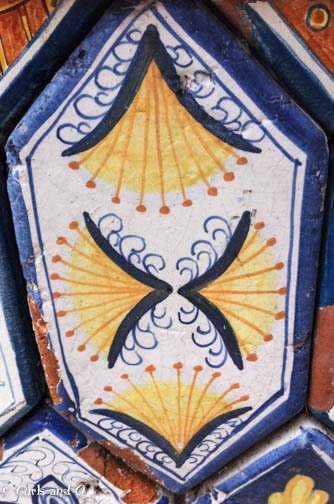 None of the patterns are to size individually but work as a whole. I remember adding the images as I went along but was very pleased with the end result. 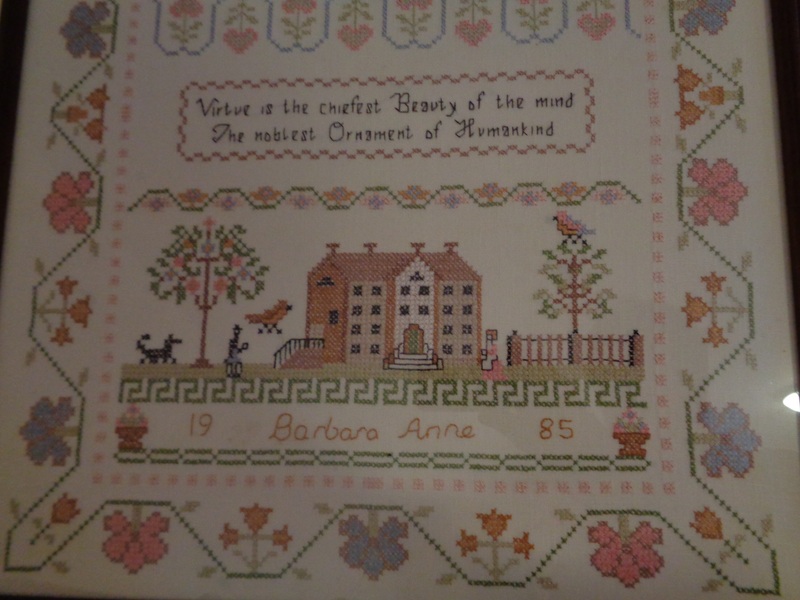 In 1993 I spent much of a summer holiday sat outside our tent in Guernsey Channel Islands, cross stitching this sampler. When I look at this craft item I can almost feel the sun on my back as I stitched away, listening to my three children laughing and playing on the camp site. Evocative, happy memories. Maybe I’ll give cross stitching another go and start another era! 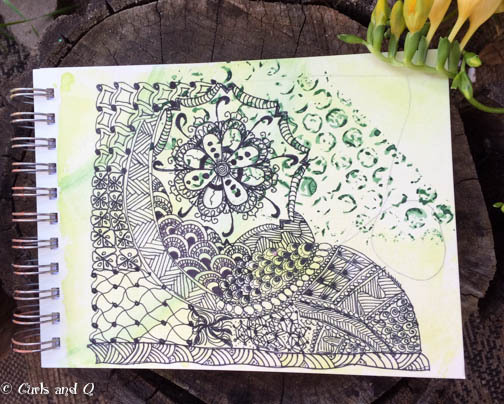 I love Zentangles! My go-to doodles. Is that a problem you ask? 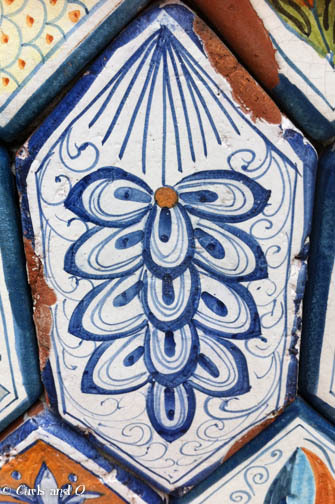 Well, I used to see quilt patterns everywhere, and now I see Zentangle patterns. 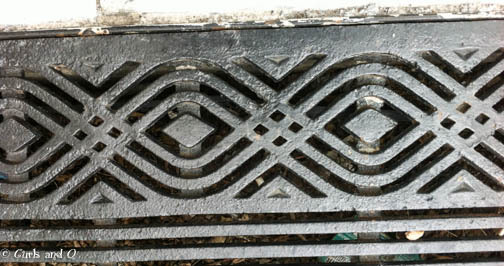 Other tourists are taking pictures of “the whole” scene and I’m hunkered down over a bit of tile, grating, ironwork, etc seeing Zentangles. 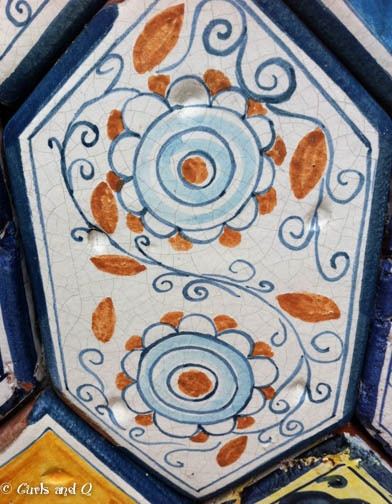 On a recent trip to Old Italy, a section in downtown San Diego, this is what I saw. Thanks for stopping by for a visit. Now go have a crafty day! 2) Tyring hard to look after Hubs whose recuperating from a Knee Replacement op. 5) Sorting Hubs medical insurance and drugs out. 7) Trying not to give Hubs Benji’s medication or use Hubs medical insurance for dog! 9) Baking cake for “unexpected visitors” who came! -and ate cake. 13) Visiting my Mum and not realising that her care home is in quarantine due to a flu outbreak. 14) Finishing reading my current book mentioned in last blog post. 16) Walking dog. In fact I think that Hubs has had a new knee as a ploy to make me walk more! phew!! Sunday evening! No wine and no pub due to Hubs still being on medication. Benji dog has finished his. See what next week brings and I will count how many times I walk Benji dog.